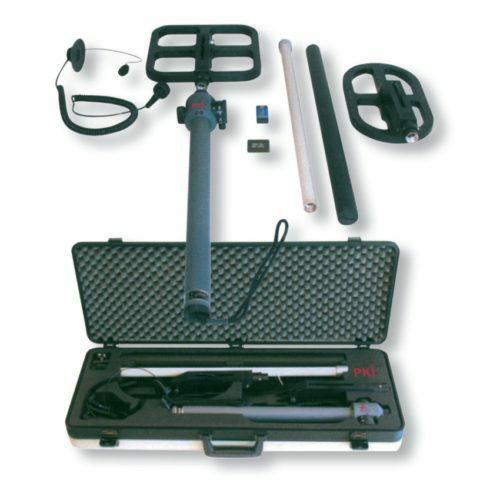 The PKI 9115 is a versatile under water detection system being consequently the further development of our former land & underwater metal detectors. Improved detection performance and a wide auto-adaptation to interfering metal components characterise the new PKI 9115. The full unit, and especially the electronic design, is based on our thousandfold proven technology being in service with many government departments worldwide. PKI 9115 is tested for water pressure up to 10 bars and is very comfortable to handle for the diver. It is operated by only one adjuster. PKI 9115 can detect minimum amount of mine shallows being buried – such as A/P 72 A – at operational depth. Larger undefined objects can be located up to a depth of 1.5 m. For even larger depths, a further sensor is available. PKI 9115 applies a dynamic mode pulse induction concept. Short bipolar magnetic pulses generate detection signals from ferrous or non-ferrous metals and alloys. Target acquisition is indicated as visual or audible alarm. A silent mode (visual LED only) improves operator’s safety on “smart” munitions with acoustic sensors. When used with a larger search head of 80 x 80 cm (optionally available), the detection range is significantly extended and larger objects – such as 105 mm shells, bombs, torpedoes etc. – may be detected at 2 m depth or more. The detector operates on a dynamic search mode, which compensates interference from metal diving equipment. If required, the detector can be operated in a “silent mode” without headset. In such case the red LED will indicate target acquisition. To operate the PKI 9115 switch the rotary sensitivity calibrator into position I (low), II or III (high). Sensitivity can be changed stepless within ranges I-III by an internal adjuster inside the electronics cylinder.